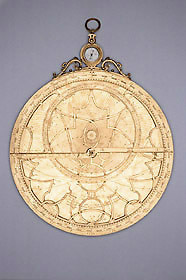 The rete of this unusually large astrolabe has a typical Flemish pattern, inspired by the Arsenius workshop in Louvain. The only plate is engraved with a list of cities with latitude 50? as indicated (extendable to 49 and 51?). On the mater there is a quadratum nauticum, with the directions engraved in Dutch and Italian. On the calendar scale on the back are also indicated the dates of several ecclesiastical festivals. The astrolabe is said to have been in the possession of the Haupsburg family, but it is not known when it was acquired by the family itself. Before being owned by the Museum of History of Science in Oxford, it belonged to the Michel collection in Brussels.